Right-wing groups and conservative Republican leaders -- having forced out the official GOP nominee in a special election for an upstate New York congressional seat because they considered her "too liberal" -- thought they had the election in the bag with their $2 million advertising campaign on behalf of the Conservative Party candidate. But in the end, the voters of the sprawling district, the largest in the Northeast, had other ideas -- and in the process, made a bit of history. Not since before the Civil War, more than 140 years ago, has New York's 23rd Congressional District been represented by a Democrat -- until now. In a hotly-contested election that saw as many twists and turns as a soap opera, Democrat Bill Owens -- with the dramatic, 11th-hour backing of the ousted Republican candidate, Dede Scozzafava -- defeated Conservative Doug Hoffman to serve the unfinished term of moderate Republican John McHugh, who resigned in June to serve as secretary of the Army in the Obama administration. With all the ballots in the nationally-watched contest counted, Owens garnered 49 percent of the vote to Hoffman's 45 percent. Scozzafava, who threw the race into uncertainty with her stunning withdrawal on Saturday and her equally dramatic endorsement of Owens on Sunday, still managed to draw six percent of the vote. The race was touted as a test of strength of the right-wing "Tea Party" movement -- whose members are referred to, with some derision, as "Teabaggers" -- which made headlines this past summer with their noisy protests at town-hall forums on health-care reform and which has declared an all-out jihad against Republicans whom they see as too liberal. But in the end, at least for this year, the "Teabaggers" -- nearly all of whom came from outside the state -- lost. They lost because they simply didn't know the district. In fact, they ruffled more than a few feathers with their overly aggressive campaign against Owens and Scozzafava and in favor of Hoffman. In turns out that some of Hoffman's supporters weren't following the rules -- and ended up getting the cops called on them. According to the Watertown Daily Times, elections officials in at least two towns in the district called police to get members of an anti-abortion group supporting Hoffman to move beyond the 100-foot perimeter of the voting stations. State law prohibits overt campaigning -- or, as the law defines it, "electioneering" -- within 100 feet of a voting station. Members of the anti-abortion group were distributing pamphlets urging voters to cast their ballot for Hoffman, a hard-line social conservative who declares on his campaign Web site that "I am pro-life, period" and that he strongly opposes same-gender marriage. Joy Yearout, a spokeswoman for the group, the Susan B. Anthony List, disputed the elections officials' reasoning for calling the police, telling the Daily Times one of her volunteers in Fowler encountered police officers without incident. "The police came and said he was fine," she said. Yearout accused elections officials of being "overzealous" and of "using the only tool they have, and that's intimidation." The 23rd Congressional District in the northeastern portion of the state, is a sprawling area that includes all or parts of Clinton, Essex, Franklin, Fulton, Hamilton, Jefferson, Lewis, Madison, Oneida, Oswego and St. Lawrence counties. It includes the cities of Ogdensburg, Oswego, Plattsburgh (part of the Greater Burlington, Vermont metropolitan area) and Watertown. The district includes most of the Adirondack Mountains and the Thousand Islands region, and borders Canada to the north. In Watertown, the county seat of Jefferson County, the two county commissioners in charge of elections personally responded to complaints of violations of the 100-foot rule by Hoffman partisans at three voting stations. Noting that the pro-Hoffman volunteers were from out-of-state, the commissioners informed them of the 100-foot rule, set up signs marking the voting station boundary and politely told the Hoffman partisans to stay outside the boundary lines. In Lewis County, elections officials ordered the removal of Hoffman campaign signs that were placed within the 100-foot perimeter of a Lowville voting station. Elaine McLear, a Lewis County elections commissioner, was unhappy with what she saw as a lack of discipline by the Hoffman campaign. "I just feel like the candidate should have their workers under control," McLear told the Daily Times. "There are ways to handle things, and we had to do what we thought was proper." The apparent overzealousness of Hoffman campaign workers on election day may have had an adverse effect on the final outcome. Although there were no exit polls conducted in the district, local newspapers were filled with editorials and letters to the editor complaining bitterly about what many in the district said was a level of campaign nastiness they had never seen before in a local election. Local TV and radio stations across the district -- from Syracuse to Burlington -- were saturated during the final two weeks of the campaign with campaign attack ads in a frenzied blitzkrieg by right-wing out-of-state groups to the prevent the House seat from going to either Owens or Scozzafava -- concentrating their fire most heavily on Scozzafava. 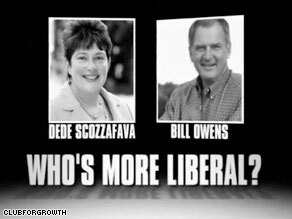 Some of the nastiest ads were by the right-wing Club for Growth, which saturated the airwaves with ads attacking both Owens and Scozzafava as "too liberal." But by far the single most controversial ad of the campaign was one that, at first glance, appeared to be an endorsement of Scozzafava by a liberal group -- but turned out instead to be a "dirty trick" ad by conservative billionaire Arkansas businessman Jackson T. (Steve) Stephens, Jr., member of the board of directors of the Club for Growth -- which heavily backed Hoffman. Stephens, president and CEO of the Little Rock, Arkansas-based pharmaceutical company ExOxEmis, Inc. and a longtime contributor to conservative Republican candidates, personally donated $4,800 -- the legal maximum under New York state election law -- to Hoffman’s campaign, and is one of the Club for Growth’s leading donors, according to records on file with the Federal Election Commission. Also annoying to voters was a massive blitz of automated telephone calls -- known as "robocalls" -- featuring the recorded voices of former Alaska Governor and GOP vice-presidential nominee Sarah Palin and former Senator Fred Thompson (R-Tennessee), who urged voters to cast their votes for Hoffman. The right-wing activists tried their best to scare voters by bringing up House Speaker Nancy Pelosi as a liberal bogeyman. But although the 23rd Congressional district has been a solidly Republican district for more than 140 years, it's not a solidly conservative one -- as evidenced by President Obama carrying the district in last year's election and Owens' victory on Tuesday. Moreover, McHugh, the wildly popular Republican who vacated the seat -- he won re-election last year by a 65 percent landslide -- is a moderate. Conservatives were hoping to repeat the feat of James L. Buckley, the older brother of the late conservative commentator and National Review magazine publisher William F. Buckley, who in 1970 was elected to the U.S. Senate on the Conservative Party line with 38 percent of the vote, defeating a liberal Republican incumbent, Charles Goodell and a liberal Democrat, Richard Ottinger, to become the first -- and to date, the only -- third-party candidate to win a statewide election in New York. Buckley was ousted six years later by Democrat Daniel Patrick Moynihan. Ironically, Buckley, now 86 and a retired federal judge, would be considered a "squishy moderate" or even a "liberal" by the hard-line conservatives of today -- as was the late former Senator Barry Goldwater (R-Arizona), the 1964 Republican presidential nominee considered "the godfather of the conservative movement." Although considered a right-wing extremist in the 1960s for his strident opposition to nuclear arms control and civil-rights legislation, Goldwater was really an old-fashioned libertarian conservative -- whose libertarian views on social issues in his later years outraged many social conservatives. He endorsed Democrat Karan English in an Arizona congressional race in 1994, urged Republicans to lay off President Bill Clinton over the Whitewater scandal and criticized the military's ban on gays. "Everyone knows that gays have served honorably in the military since at least the time of Julius Caesar," he said. "You don't have to be straight to be in the military; you just have to be able to shoot straight." He further angered social conservatives by testifying before the city council of his hometown of Phoenix in favor of an ordinance to ban discrimination against gays and backing a statewide voter initiative to legalize medical marijuana. In a 1994 interview with the Washington Post the retired senator said, "When you say 'radical right' today, I think of these moneymaking ventures by fellows like Pat Robertson and others who are trying to take the Republican Party and make a religious organization out of it. If that ever happens, kiss politics goodbye." Goldwater finally broke outright from social conservatives -- particularly the Religious Right -- a few months before his death in 1996 when he bluntly warned them: "Do not associate my name with anything you do. You are extremists, and you've hurt the Republican Party much more than the Democrats have." He told Bob Dole, whose own presidential campaign that year received lukewarm support from social conservatives, "We're the new liberals of the Republican Party. Can you imagine that?" The ideological rigidity of today's conservatives -- as embodied in the "Tebagger" movement -- may prove fatal to the Republican Party in the long run. Republican Candidate Pulls Out a Day After Right-Wing Group Pulls Dirty Trick With TV Ad 'Praising' Her Liberal Stances on Abortion and Same-Gender Marriage; With Less Than 24 Hours to Go Before Voters in Upstate New York's 23rd Congressional District Go to the Polls, Can Democrat Bill Owens Prevent the Right's Takeover Of a District That Obama Carried a Year Ago? In a stunning victory for the right-wing "Teabagger" movement's all-out jihad to purge the Republican Party of its last remaining moderates and Northeastern liberals, GOP candidate Dede Scozzafava announced Saturday that she was dropping out of the campaign for Tuesday's hotly-contested special election in upstate New York's 23rd congressional district. Scozzafava -- citing polls showing her badly trailing both Democratic candidate Bill Owens and Conservative Party nominee Douglas Hoffman -- said that she was pulling out of the nationally-watched contest because her campaign lacked the money to respond to a last-minute blizzard of TV and radio ads by right-wing, out-of-state groups backing Hoffman and attacking both Owens and Scozzafava. Her withdrawal announcement also came just a day after an ostensibly pro-Scozzafava TV ad hit the airwaves, urging liberal voters to support her candidacy, specifically citing Scozzafava's support for abortion rights and same-gender marriage -- which are both anathema to hard-line social conservatives who form the backbone of the GOP's still-shrinking voter base. In a sometimes-emotional press conference, Scozzafava told reporters that "The reality that I've come to accept is that in today's political arena, [is that] you must be able to back up your message with money -- and as I've been outspent on both sides, I've been unable to effectively address many of the charges that have been made about my record. Scozzafava's decision to pull out came just hours after the release of a Siena Research Institute poll showing that her support had crumbled since September. The poll, conducted from Tuesday through Thursday of last week, showed Owens holding a razor-thin one-point lead over Hoffman, 36 percent to 35 percent. Scozzafava trailed far behind at 20 percent, with only nine percent of voters still undecided. The results marked a dramatic reversal from the end of September, when Scozzafava led with 35 percent, owens second at 28 percent and Hoffman trailing with 16 percent. Many observers attribute Scozzfava's reversal with the blizzard of attack ads against her by the Club For Growth and other right-wing groups, including the highly combative National Republican Trust Political Action Committee -- which became notorious last year for its last-minute fusillade of attack ads against Obama that brought up the president's controversial former pastor, Reverend Jeremiah Wright, in open defiance of GOP nominee John McCain's strict ban on his campaign bringing up the now-retired minister, out of fear of being accused of "race-baiting." Scozzafava's fate, however, may have been sealed on Friday, when a last-minute TV ad hit the airwaves that appeared, at first glance, to be an endorsement of the liberal Republican, calling her "the best choice for progressives." The ad, which claimed to have been produced and paid for by a group calling itself "Common Sense in America LLC," praised Scozzafava for her support of Obama's $787 billion economic stimulus package. But then it also lauded her support for abortion rights and cites her as "the only candidate who supports marriage equality" -- same-gender marriage -- as a rainbow flag, a universally recognized symbol of the gay community, appeared in the background behind a pair of wedding rings. Within hours after the ads began airing, "Common Sense in America LLC" -- not to be confused with the conservative media watchdog Common Sense America or with the libertarian group Common Sense For America -- was quickly exposed as a front group for billionaire Arkansas businessman Jackson T. (Steve) Stephens, Jr., a board member of the right-wing Club for Growth -- which is heavily backing Hoffman. A trace of the telephone number for "Common Sense in America" displayed near the end of the ad turns out to be that of the Little Rock headquarters of ExOxEmis. Local TV and radio stations across the district -- from Syracuse to Burlington -- have been saturated for the past two weeks with campaign attack ads in a frenzied blitzkrieg by right-wing groups to the prevent the House seat vacated by John McHugh from going to either Owens or Scozzafava -- but have concentrated their fire most heavily on Scozzafava. McHugh, a popular moderate Republican who easily won re-election by a 65 percent landslide last year, stepped down in June after he was nominated by President Obama to serve as secretary of the Army, but wasn't confirmed by the Senate until September. Before moving to the Obama administration, McHugh was the ranking Republican on the House Armed Services Committee. McHugh's departure from Capitol Hill left the 29-member New York House delegation with only two Republicans. A Hoffman victory in tomorrow's special election would be a major upset, in that Republicans are nearly invisible in the two regions of the country -- the Northeast and the West Coast -- where Democrats dominate not only their congressional delegations, but also the regions' state legislatures and governorships. Moreover, Republican officeholders in the Northeast -- because Democrats so thoroughly dominate the region -- have, out of electoral necessity, been more moderate than Republicans in the rest of the country, particularly on social issues. Scozzafava's apparent defeat is the most dramatic display yet of what appears to be a nationwide attempt by the hard-line right-wing "tea party" movement to purge the GOP of all of its last remaining moderates and Northeastern liberals. The movement asserts that Scozzafava, because of her support for abortion rights and same-gender marriage, is far too liberal and does not belong in the party. In Missouri, Liz Lauber, running in the Republican primary to unseat five-term Republican incumbent Representative Todd Akin, made support for Hoffman a major campaign issue last week, issuing a direct challenge to Akin to endorse and donate money to the Conservative Party nominee -- which Akin promptly did. A spokesman for Akin, however, insisted that the congressman's endorsement was not a response to Lauber's challenge, but rather to "calls received from constituents asking where the congressman stood on the race." Spokesman Steve Taylor told The Washington Times that "It would be difficult to surpass the lawmaker when it comes to conservative credentials -- he has a 100 percent rating from the American Conservative Union and has routinely voted to limit the size of government." In Florida, moderate Republican Governor Charlie Crist is being challenged in the 2010 GOP Senate primary by conservative Marco Rubio, a former speaker of the Florida House or Representatives, who has made an issue of Crist's outspoken support for the president's economic stimulus package. But Rubio could be hurt by another hot-button issue among conservatives -- immigration. Rubio is a Miami-born Cuban-American contesting for the Senate seat that was vacated by another Miami-born Cuban-American: Mel Martinez, who resigned in August for what he said were "personal reasons,' but amid widespread rumors that Martinez had become disillusioned with the GOP after a falling-out with hard-line right-wing nativists within the party over immigration during his tenure as GOP's general chairman from November 2006 until he quit that post in October 2007. The nastiness over the immigration issue, which has sometimes flared into thinly-disguised anti-Latino bias, has caused a deep rift to develop between the GOP and Latino voters, including the conservative, longtime Republican-friendly Cuban-American community in southern Florida -- and may have been, although he won't admit it publicly, a contributing factor in Martinez's resignation. WITH SCOZZAFAVA OUT, CAN OWENS DRAW ENOUGH MODERATES TO STOP HOFFMAN? With Scozzafava now out of the race -- although her name will remain on the ballot -- the question immediately arises: Can Owens draw enough support from moderate Republicans and independents in the district turned off by Hoffman's social views -- and his strong backing from hard-line right-wing outsiders -- to stop him tomorrow? With polls showing the race too close to call, a last-minute push by top Democratic heavyweights for Owens -- including an Election Eve campaign swing through the district today (Monday) by Vice President Joe Biden -- is certain to add to the drama. And in a new round of TV and radio ads, liberal groups, including Accountable America, attempt to tie Hoffman to the Wall Street financial crisis. Meanwhile, MoveOn.org has launched a fundraising drive to defeat Hoffman, who the group says represents "teabaggers and hate groups." It could be a very long night on Tuesday.